Being ready for every situation possible when at home will always be a challenge. For the most part, you want to have what you need around the house at all times. In fact, you may have some of the things you need already. Even so, some of us often look for a better way to get things done when the time comes. Finding products that are better than what you may already have around. Especially when it comes to cleaning, which will always be important for many reasons. While cleaning is one focus, it can all be a bit more extra when you have a home full of pets. Dealing with excess pet hair all around your home can be pretty overwhelming from time to time. It can get just about everywhere even your clothes. So, its time to fight back and win the battle with all that pet hair. Evercare® Mega Lint Roller – this extra-wide adhesive roller features an extendable handle that makes it easy to pick up lint, hair, and debris on floors and large surfaces. The 10-inch adhesive surface is even strong enough to pick up coins, paperclips, and more! 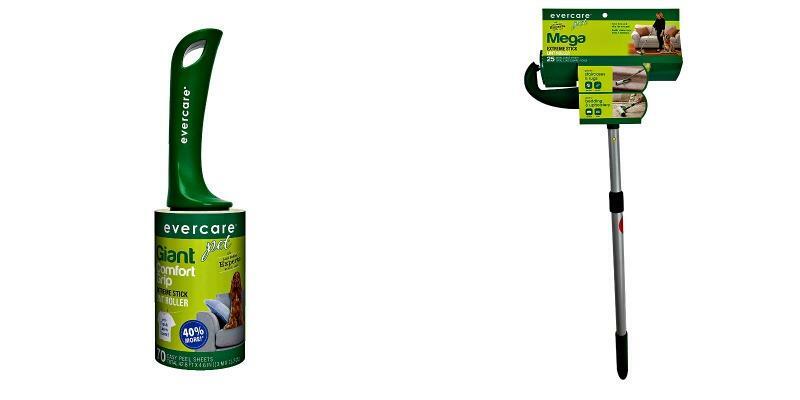 The evercare® Mega Lint Roller is extra wide, extra sticky, and built to last. With either one of these options, you can take the fight straight to the pet hair. Actually, think of it as a gift to yourself and your home for the holidays. It could even be a unique gift for any pet lover you may know. With that being said, make sure you check out all of the information I have for you above.